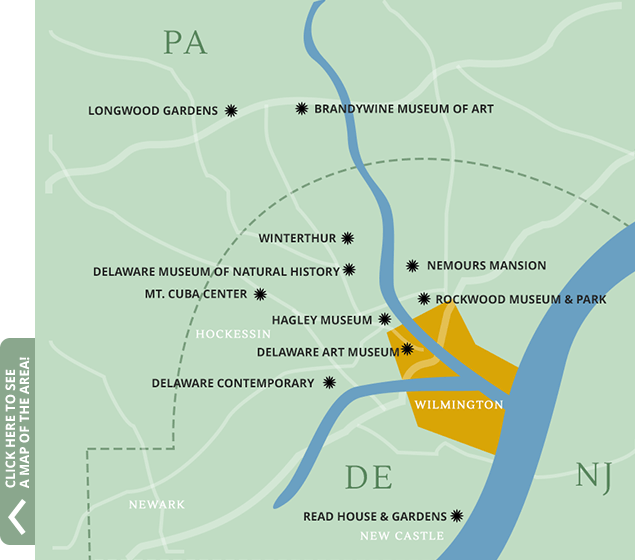 The Brandywine Valley—which starts in Wilmington, Delaware—is known for its beautiful cultural attractions, ranging from history and heritage to contemporary art. 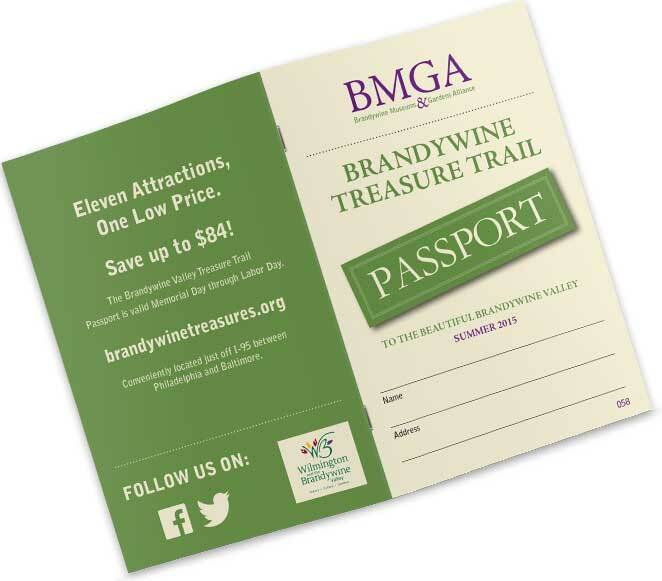 The Brandywine Treasure Trail Passport provides savings on entrance to the area’s top 11 attractions between Memorial Day and Labor Day, allowing passport holders to explore each at a discount and at their convenience. Continue scrolling to discover these 11 gems of the Brandywine Valley. Du Pont is a name that you hear a lot along the Brandywine Treasure Trail. The Nemours Mansion is the former home of Alfred du Pont. There is something passionate about the opulence here, making it no surprise to hear that Alfred du Pont built the house as a gift for his second wife, Alicia. She loved 18th-century French architecture, and the stunning home was modeled after Versailles. The gardens utilize a French design as well, with the work of French sculptors Prosper Lecourtier and Henri Crenier making it lushly magnificent. Not to miss: Achievement, a towering golden sculpture on a marble pedestal, provides a centerpiece for the grounds opposite the romantic façade of a mansion that makes you feel like you’ve been transported to another time and place. The long pool and 157 jets spraying in a choreographed arc are a mere prelude. The Winterthur house represents another chapter in the du Pont family history—the childhood home of Henry Francis du Pont. Today, it is a garden bursting with color, a library established to facilitate studies of American art and a museum that houses one of the most important collections of Americana in the United States. Not to miss: The Campbell Collection of Soup Tureens, an entire collection of impossibly elegant, covered dishes for soup. The collection was originally assembled by Campbell’s Soup Company, but found its home in the Winterthur Museum, a fitting addition to a home where people have always been welcomed and entertained in lavish style. Nature itself takes center stage at the Delaware Museum of Natural History. The Dinosaur Gallery takes visitors on a Jurassic journey, the Hall of Birds brings them to the skies and the Shell Gallery plunges visitors deep into Australia’s Great Barrier Reef. Ever-changing national exhibits mean that visitors always have somewhere new, and special, to explore. Not to miss: The Nature Nook adds a special dimension that sets the Delaware Museum of Natural History apart. Living animals are hidden in some of the exhibits, and museum staff members are on hand to explain the finer details of slithery snakes and cute, furry handfuls alike. The Mt. Cuba Center further indulges a love of gardens. The gardens here are less manicured around the ponds, lending to the idea that you’ve stumbled upon this surprising beauty while on a stroll. Sit back and admire trees that stretch their limbs luxuriously, seeming to gaze at their reflections in the placid surface of the pond below. Not to miss: The trees along the Dogwood Path also seem to have come to life, reaching out to each other above a carpet of green grass below. The winding path seems to invite visitors to venture forward into the peaceful wilderness. The blooming trees definitely make this a favorite spot among all of the natural beauty contained at Mt. Cuba. A few miles outside of Wilmington, the Brandywine River Museum of Art is set among trees and flowers along the river. The former 19th-century mill now includes a modern steel and glass addition, and the illustrious collection within is celebrated for including the work of three generations of Wyeth family art: N. C., Andrew and Jamie Wyeth. Once inside, the carefully curated collection of American art includes a special focus on art from the Brandywine Valley. Not to miss: explore the inspiration for many of artist Andrew Wyeth’s paintings at Kuerner Farm, a 10-minute drive from the museum. Docent-led tours make connections between Wyeth’s work and actual sites on the property. Look out at the world from the vantage point of the boy who would develop into the artist, and begin to understand why the house and farm fascinated the painter from childhood. Perhaps walking those floors, absorbing those views, or breathing the air that lambs and cows and barnyard cats breathed helped make Wyeth into the artist he became. These are no ordinary gardens—most think gardens such as these only exist on the grounds of castles or British manors. The extraordinary Longwood Gardens, voted the Best Botanical Garden for 2016 by readers of USA TODAY and 10Best, feature the Longwood Hybrid Cineraria, a cheerful bloom dressed in bold periwinkle created by the Longwood horticulturists. It is just one of the 11,000 plants that can be found in the outdoor gardens. Follow paths through sprawling fields of blooms in a rainbow of colors, below fluffy trees and past expertly trimmed hedges in fun shapes. Not to miss: the Conservatory, an indoor shelter with 20 different gardens, which allowed the du Pont family to enjoy nature, even in a cold Northeast winter. You may forget you are inside as you walk past flowing water and plants as thick as a jungle landscape. The mushroom-shaped sculpture dotted with nearly 1,000 pale chrysanthemum blooms takes the stage, leaving viewers in awe at the marriage of natural beauty and artistic design. The Hagley Museum & Library—a gorgeous mansion, museum, library and former business on manicured grounds—draws visitors into a time long past. Walk through the story, business offices and homestead of the du Pont family, whose company supplied more than half of the black powder used by the Union Army in the Civil War, as well as the dynamite that was used to build railroads across the West. Other highlights include permanent and changing exhibits, as well as the library, a renowned research center dedicated to preserving the history of American business. Not to miss: the Powder Yard. The museum tells a story of an American family, but it also tells the story of work that mattered, of men who spent their days toiling in explosive dust. Exploring their workspace also reveals the ingenuity of early American engineering, the millworks, cogs, wheels, tracks with moving carts, and massive drill bits, all set in a historic building next to the running water that made it possible. The Delaware Art Museum features many pre-Raphaelite visionaries—it’s the largest collection outside of the British Isles—and the sculpture gardens provide a beautiful outdoor backdrop for some attention-grabbing three-dimensional pieces. Not to miss: The Howard Pyle collection showcases the drawings and paintings of Howard Pyle, whose images were published in Harper’s Monthly, among others. Pyle was the father of American illustration and taught aforementioned N. C. Wyeth. Vincent van Gogh was a fan. Read House and the historic village where it’s located take us back to America in its infancy. You might not guess from the Read House’s stalwart appearance, but the inside speaks of elegance, from the furnishings to the wistful Delaware River views. The gardens provide a final lesson in Colonial history—beneath their carefully manicured beauty, archaeologists have discovered artifacts that have brought the lives of the people who lived there over the centuries to light. Not to miss: Before reaching the Read House, stroll down cobblestone streets in Historic New Castle, take a turn on the town green and admire many historic buildings that are still in perfect shape after hundreds of years of use. The red brick house off of The Strand is a stone’s throw from taverns where Revolutionary War heroes quenched their thirst and colonial merchants pedaled their wares. Although the Brandywine Trail is steeped in history, it makes room for modern as well. This contemporary art museum reminds Brandywine Trail blazers that Wilmington is not only about the past through 30 exhibitions that showcase the abstract and the thought-provoking. The Rockwood Park provides plenty of trails for walking enthusiasts to meander down, each outfitted with its fair share of greenery and eye-pleasing views. The museum is fascinating in its own right, providing a picture of yet another era of life in Delaware through the Bringhurst family’s 20th century furnishings and photographs. Not to miss: The ultimate treat, The Delaware Shakespeare Festival’s performance, is held each summer in the park. Audience members sit on blankets or lawn chairs and eat a picnic before the performance, and then watch as the actors bring the Bard to life in the open-air of a Wilmington evening. When visitors have filled their minds with every kind of art—whether created by nature or man, whether an homage to the past or a glimpse into the future—they have still not seen all of Wilmington. Check out Merchant Bar in Wilmington’s cultural district for hip craft cocktails, wine on tap and food you won’t want to—but should—share. Wilmington’s Trolley Square neighborhood has an energetic nightlife scene—expect live music and welcoming bars. Theatergoers have their choice of great venues, including a variety of plays and concerts at The Playhouse on Rodney Square in the Hotel du Pont and the Candlelight Theater, where patrons are invited to fill their bellies with hearty food and laughter, all within the environs of a big red barn. The Brandywine Passport is your ticket to exploration within this beautiful corner of Delaware. Discover the rich art, history and culture of the area and appreciate the beauty surrounding its most unique attractions. Purchase your Brandywine Treasure Trail Passport and plan your getaway.